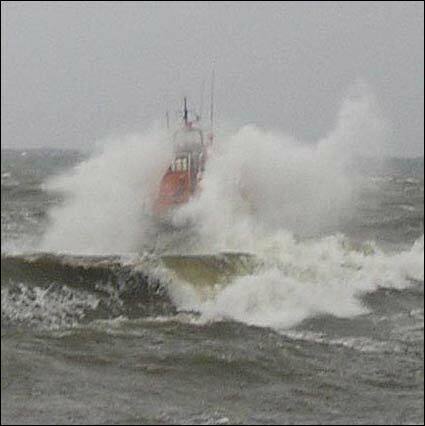 The size and characteristics of the Trent class lifeboat makes it a photogenic subject more so when the sea is running, the water rough. 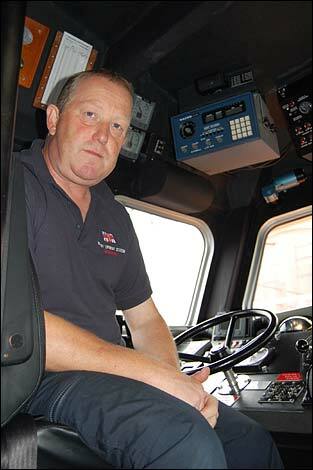 I have been to sea on the current Whitby lifeboat George and Mary Webb and can testify to how secure the crew must feel when strapped in, the array of electronics is impressive and equipment equally so. It seems strange that a boat of this size can be still capable of self righting itself if the waterproof doors and hatches are secured. Trent class lifeboats make up part of the RNLI all weather fleet and are named after the River Trent. 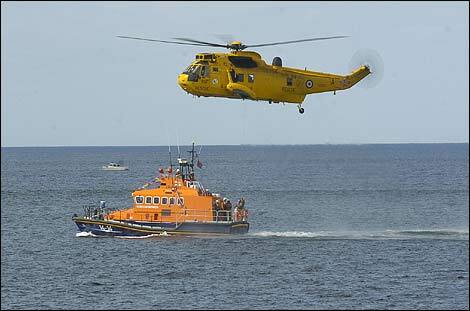 Designed to lie afloat at a berth, the offshore Trent class lifeboat entered service in 1994 as an abridged, but robust adaptation of the Severn class lifeboat. Designed and built by Green Marine, each boat is constructed of over 100 mm thick fibre reinforced composite topsides, single laminate double hull bottoms, 4 water-tight bulkheads with epoxy, glass and Kevlar shields. 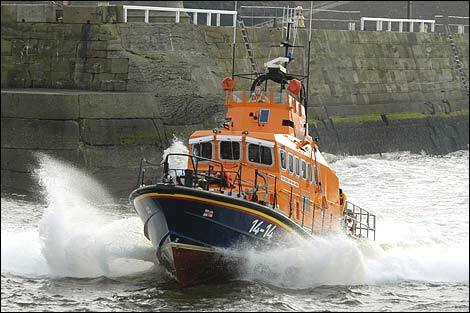 With such strong builds the Trent class lifeboat are designed to operate in Europe's most hostile waters, allowing them and their crew to leave port when those ashore seek shelter. 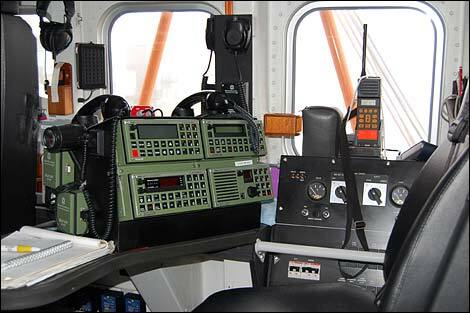 The comprehensive electronics fit includes full radio equipment including Navtex Multi-Frequency, Marine Very High Frequency and DSC installations. For navigation the crew utilize an array of digital select systems including DGPS equipment, and an electronic Laserplot chart display and information system which allows complete automated management via the vessel's onboard processors (autohelm), although comparatively infrequent in practice. 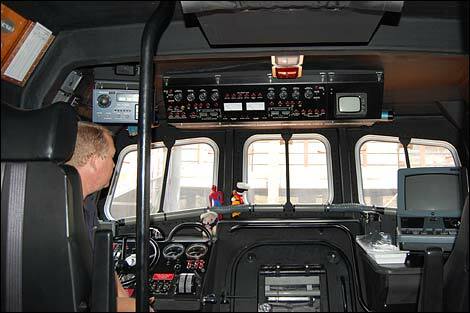 VHF/DF, radar and weather sensors are other features pertaining to the lifeboat. Provisions for survivors include complete First Aid Equipment including the Basket and Neil Robertson stretchers, oxygen and Entonox breathing systems, ambulance pouch, thermodynamic food canisters and even sick bags for ailing casualties. 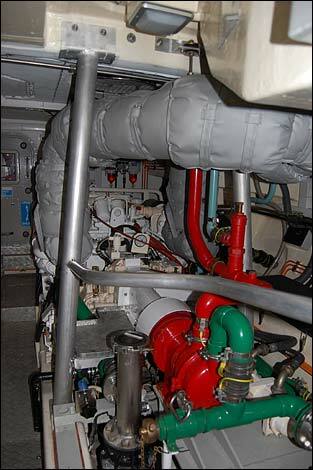 Trent lifeboats house a small toilet arrangement, while the afterdeck houses a salvage pump in a water-tight container for use in inter-vessel salvage, while the presence of two fire hoses allow proficient firefighting. The following photographs of the George and Mary Webb, begin with one including our present coxswain Mike Russell. The George and Mary Webb, makes for some very good photographic opportunities and was pleased to be able to add two galleries related to the 2009 lifeboat weekend. 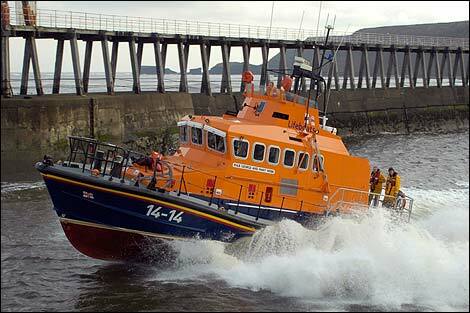 I have recently acquired an MC Excel file from the RNLI which has a wealth of data to it surrounding the lifeboat. The file includes columns detailing the type of casualty, cause of service, hours at sea and much much more and can be accessed using the following link.